Free entry for kids up-to 2 years old. Whoever wished for soulful Saturdays, has been heard! Step into the world of Sufi music with the second edition of The Sufi Route by the Friday Music Project. Headlining the second edition of the age-agnostic cultural extravaganza will be British singer-songwriter of Azerbaijani origin Sami Yusuf who makes his India debut, along with music legend A. R. Rahman. 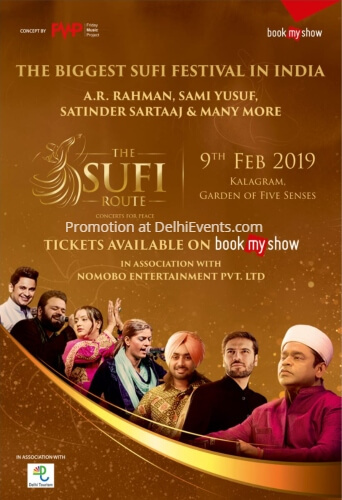 Set amidst an ethereal ambience at the Garden of Five Senses, sufi music stalwarts including Satinder Sartaaj, Nooran Sisters and Dhruv Sangari will merge old world mysticism with new world allure through their magical renditions. Renowned lyricist and poet Manoj Muntashir will host the evening taking you down the rich cultural heritage of sufism, making it an evening you just cannot miss. In the chilly winters of the city, let the Sufi Gods take you on a journey from the traditional Dervish and Qawwali forms to explore modern innovators inspired by the spirit of Sufism.